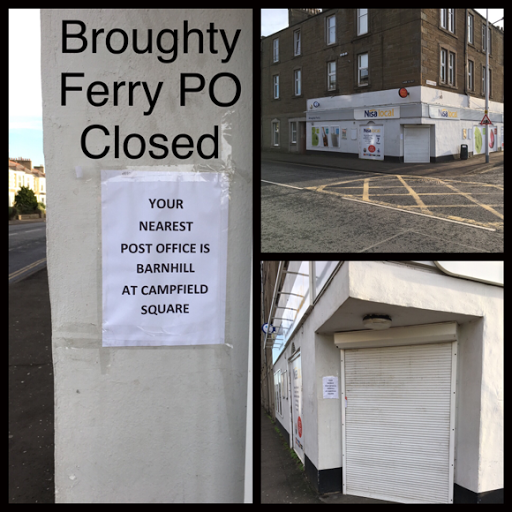 On Wednesday morning I became aware that the Post Office hosted in the NISA Local store at the corner of Queen Street and Gray Street in Broughty Ferry had abruptly closed. I went round there to discover that the only information about the closure was a printed sign directing folk, 'Your nearest Post Office is Barnhill at Campfield Square'. Clearly this will be very inconvenient for the many customers that use and rely on this Post Office and turn up to find that inexplicably the doors are shut. Later, I contacted the Post Office who confirmed the closure but as yet could not confirm the timescale for the advertisement of the franchise. I had hoped that the existing post office staff and counter might be temporarily relocated to another premises in the central Broughty Ferry shopping area to preserve the post office service and the jobs of the staff. I will continue to pursue the Post Office management to try to ensure there is a replacement full service post office in central Broughty Ferry and minimise the time for this to be established.